Bottom line: After trying AT&T Family Map, I’ve drawn the conclusion that it is definitely not one of my favorites. The price and limit to only phones on family plans is too restrictive and will not work with families with teenagers or college aged children.  There are many family locator services out there that will work for any type of family but this does not seem to be one of them. Pros and Cons: AT&T Family Maps seems to have a few pros but many cons. One of the pros is definitely the schedule checks. It’s nice to get a reminder text or email to notify me if my child has arrived to his or her destination safely and let me know what time as well. Not having to download any apps on any of the phones is also a plus. One of the cons is definitely the price. Most family locator services are approximately $5 per month. AT&T Family Map is more than double that and, depending on how many phones you want to track, it can cost as much as three times more than other comparable plans. The fact that only cell phones on the family plan can be tracked is a major negative. Teenagers, spouses and boyfriends often choose to go on to an individual plan instead of being tied to a family plan and this prevents you from being able to use AT&T Family Map with them. A limit or 2 phones for $9.99 and no more than 5 for $14.99 is also something I was not happy about. Many families today have multiple children and also care for family members, including parents and siblings, so a 5 phone limit may not be enough. In addition to that, what about wanting to track friends that are not on AT&T. This is unfortunately not possible as oppose to LociLoci and Life360 where it is. If you’re the type of person that likes to keep track of your teenagers, your spouse, your friends or anyone else in your life, you most likely have one of the many family locator services available for your tablet, computer and cell phone. 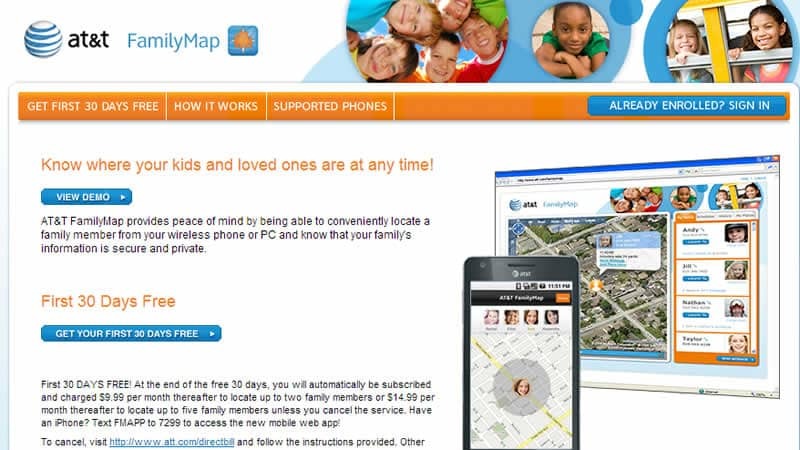 Several years ago, AT&T launched its own family tracking service known as AT&T Family Map. AT&T’s Family Map allows an individual to track other AT&T users via a cell phone, desktop computer or laptop. AT&T Family Map is similar to other family locator services in that it allows you to track family members by locating them on an interactive map. One difference with AT&T’s service is that it also offers the option for tracking text messages to be sent. These are known as “Schedule Checks”. As a parent, you may opt to receive a message each day when your child arrives at school so you know if he/she arrived on time and if he/she arrived safely. It is also ideal for parents with children away at college. It provides reassurance that your child has arrived home each evening after school, after work or a after a night out with friends. 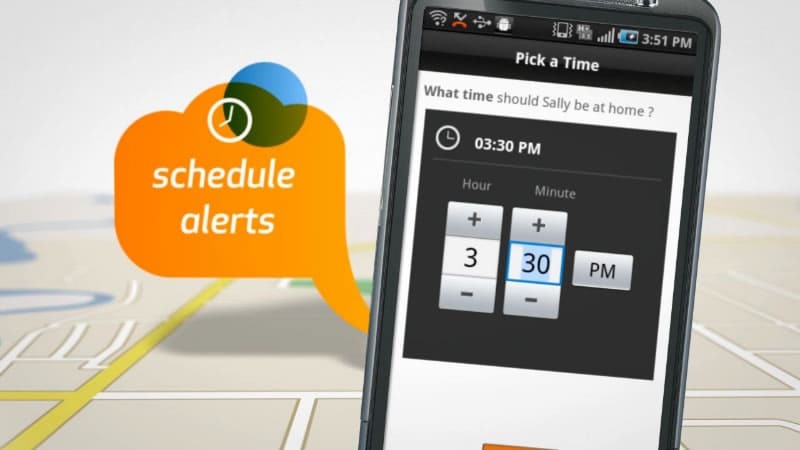 AT&T Family Map’s interface is a bit more complicated than most because of the text alert and scheduling features that it has. The map interface is from Google maps and offers street, satellite or hybrid maps. After you log in to Family Maps, you have the option of seeing the location in real time or seeing prior time stamped locations as well. The locations are identified by family members’ photos on the map and you can preset the photo you prefer by adding one that is currently on your phone or taking a new one. I found accuracy to be somewhat lacking with AT&T Family Map, but this seems to be common with these services. The location was commonly off by several hundred yards and, in a busy city with homes and businesses in close proximity, this made it difficult to really know where my son was. AT&T Family Map uses GPS satellites and cell tower information to get the most accurate location possible. Setting up an AT&T Family Map account is fairly simple. You’ll need to log onto a personal computer and go to AT&T’s Family Map website. Once there, you’ll be prompted to enter your mobile number and a temporary password that will be sent to you via text message. You’ll then need to access your Family Map account and change your preset password. After completing the initial set up process, you can begin adding phones that you wish to track. A drop down list of available numbers will be displayed for you to choose from. This is one of the many drawbacks to AT&T’s family locator service, Family Map. All phones being tracked must be on your AT&T Family Plan. Therefore, if your child or spouse has his or her own individual plan, you will not be able to use the service. After you choose one of the available numbers to add, a text message will be sent to the phone in order to request permission to be tracked. Text messages will continue to be sent periodically over time to remind the user that their phone is part of AT&T’s Family Map family locator service and their location is being made available to the plan’s manager on a regular basis. AT&T Family Plan does not require you to download and install any apps and it can be used to track both regular phones and smartphones. AT&T Family Maps seems to be one of the middle ground family locator services. It doesn’t have an overwhelming amount of features but it does have a few extras. The Schedule Check feature on AT&T is one of my favorites and it is unique to AT&T. It allows you to set specific days and times to check your family member’s location and text you to let you know where they are at that specific time. These alerts can be set daily or weekly and you can schedule multiple schedule checks throughout the day. You can choose to receive a text message, email or both to notify you regarding your preset schedule check. As a parent of an active teenager, I liked this feature because it let me know that my son arrived at school on time and arrived at soccer practice safely since it is held late in the evening. When you are setting up Schedule Checks, you have to be sure to check the box that also sends you alerts when your family member is at or near the selected location. It is defaulted to notify you only when the phone is not at the specified location that it is supposed to be at. AT&T family locator is one of the more costly plans and starts at $9.99 per month. For $9.99, you can locate up to 2 phones on your family plan. For $14.99, you’ll be able to locate up to 5 phones. As with most locator services, AT&T will let you try Family Maps for free during a 30 day free trial period. If you forget to cancel after the 30 day period, AT&T will automatically subscribe you to the $9.99 per month plan. This is definitely something I don’t like.